The hostess sent us three small pieces of fabric, 2 scraps of white, and a cream background teacup. To this she added a snippet of lace trim, a pewter teapot charm, and a brass basket charm. Eclectic mix to be sure! 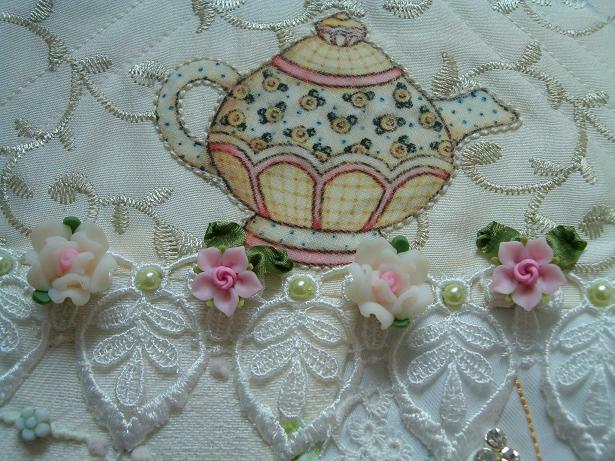 I pieced my block of creams and white with lot's of lace to make it girly! 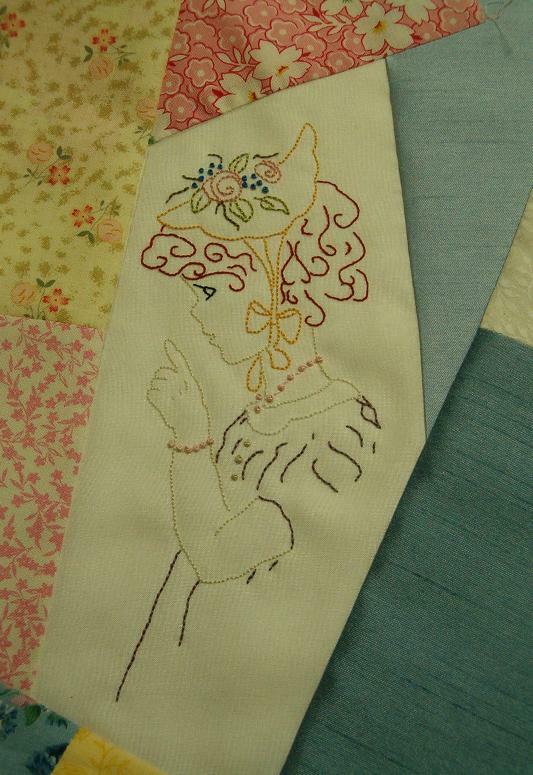 Next I found a photo of some Mary Engelbret stickers and enlarged them, printed on silk, and added fusible to the back for adhering to the block. 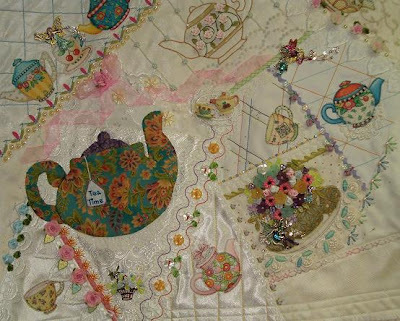 I treated several seams as "shelves" and set my ME teapots and cups there. The white/cream backgrounds in the patches bothered me...so I stitched some "wallpaper" on them. 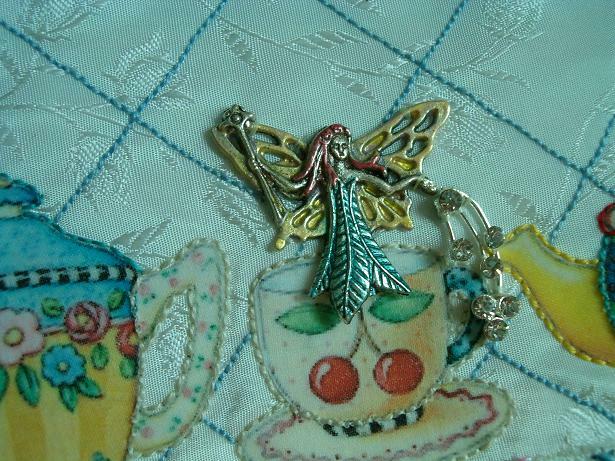 An applique teapot and an embroidered teapot were added to the mix; along with several of my pewter fairies. The fairies and the pewter teapot charm were painted with nail polish. 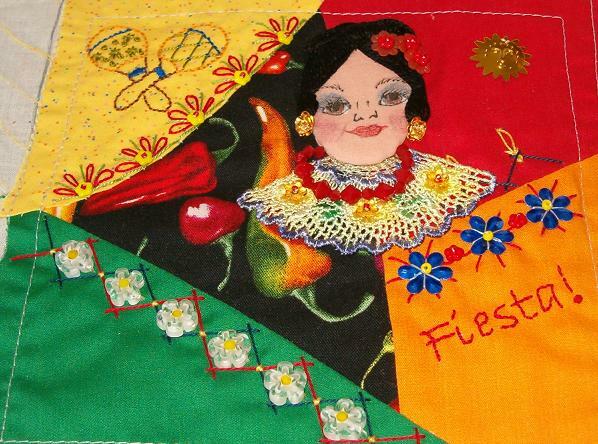 The basket charm was also painted to blend with all the other elements. 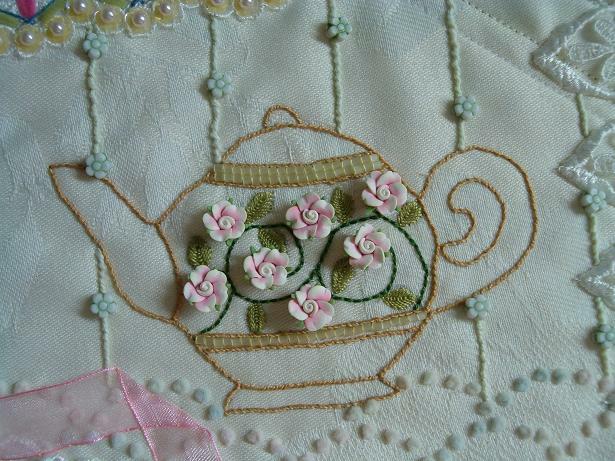 and voila a Fairy Tea Party Block! I like the "wallpaper" and will do that again...but hand stitching all those back-stitches and wrapped back-stitches took some time!! 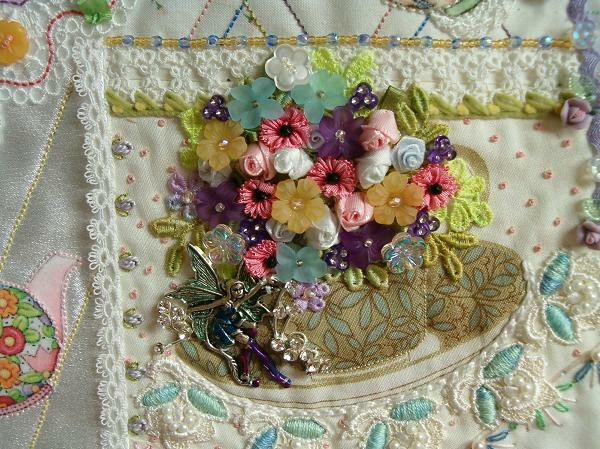 Here's the close up of the teacup fabric square...filed with flowers and a dancing fairy. Just spent a lovely couple of hours with my granddaughter...playing with fingernail polish! And we didn't make too bad of a mess! 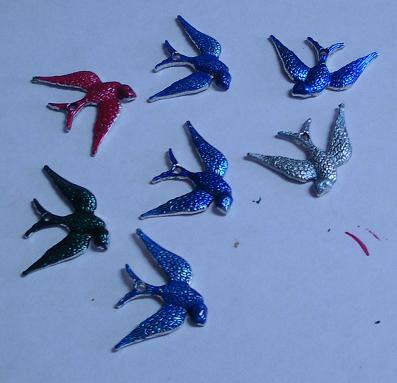 We polished up some pewter charms, like this birds. Not hard to do, and if you let the polish dry completely (before picking them up) you don't get it all over your fingers either. Of course, that's not an easy concept to get across to a six year old! 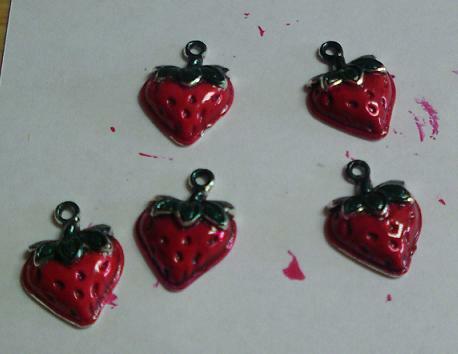 And while looking for some charms for Aidan to paint on I found these cute little strawberries...so, of course, I had to paint them up too! I think there is a fat quarter of strawberry fabric around here somewhere...if I can locate it, a pincushion might be in the works this week! And...these photos were taken with my new phone. I upgraded my service (another 2 year contract with Verizon) but that's okay since I like their service. Anyway, the phone cost me a whole $12 in shipping...and it has a 5.1 mega pixel camera (the real reason for me deciding to upgrade). My actual camera is a 3.2 MP and is starting to make strange sounds...so the phone is my backup plan if the camera goes out completely. 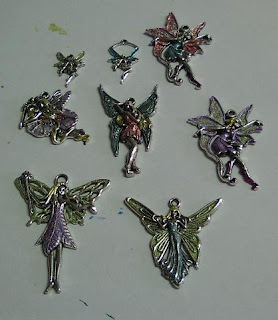 So, if ya'll have pewter charms and want to add some color to them...just pull out your fingernail polish and go to town! I buy up the "odd" colors when they go on sale...and have about 30-40 shades now. If you don't have any charms...and want some...just check out what the Studio has (link above). I'd be happy to polish them for you at no charge if you like. But, I encourage you to give this a try...it's loads of fun! Lot's of fun for kid's projects too! And if you don't like the results...just a cotton ball with fingernail polish remover clears all of your mistakes away! I am in the HGTV "All I Want For Christmas" swap...and have been gathering and making things for my secret "polly" to receive for her Christmas. When I saw this hussif pattern, I just had to try my hand at red-work embroidery...and it's my first project in red-work, so don't be too critical! 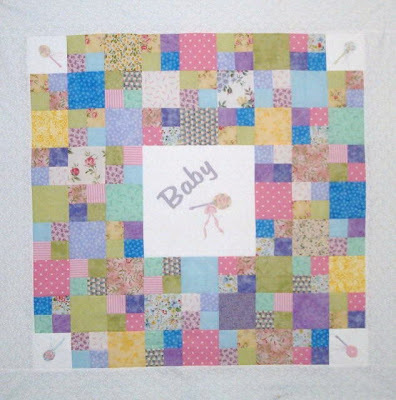 The pdf pattern is by Kaaren Johnston who has wonderful things to share on her blog! I changed the design up a little by adding a pocket for bead containers, and adjusting the layout to fit the size I wanted. 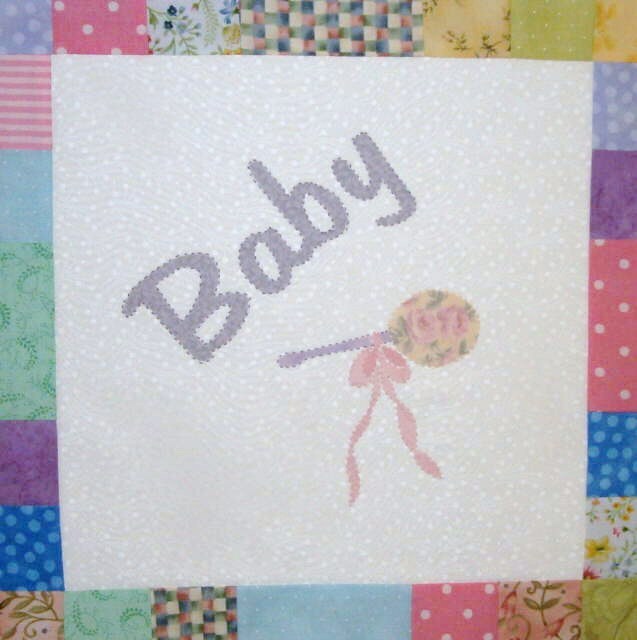 Aidan is always asking me when I'll have time to stitch something "beautiful" for her. So, here are two embroidery blocks that went into creating her a little waste basket...which she filled with her jewelry instead! 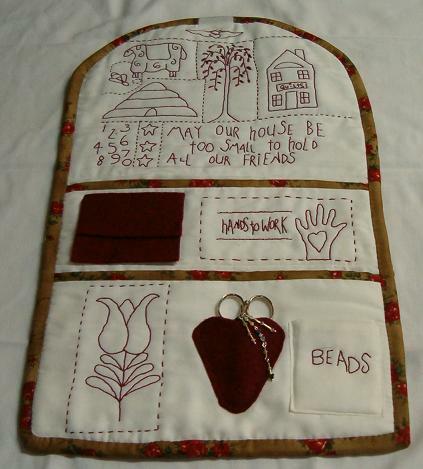 I really enjoyed stitching them, and am going to do them again...for another project! 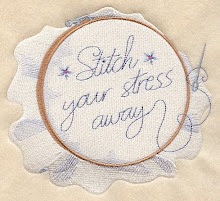 Perhaps in a different size...but I want to do more embroidery work now. Some how, it is my current craving! 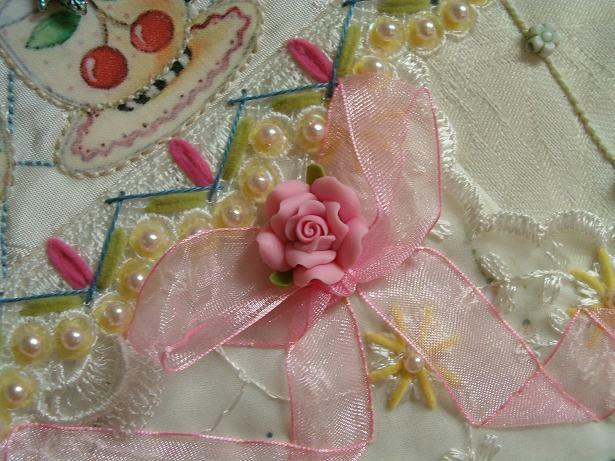 A few of the ladies on HGTV Message Board had a beaded button swap not long ago. We decided to make the use of button "blanks" optional...so I created a tutorial on how to make beaded buttons, without having to purchase button kits. Here's the link to the tutorial if you want to make your own beaded buttons! 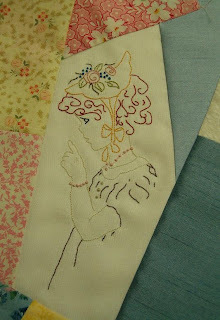 I've been posting about stitch templates since beginning the Twelve Dozen in Twelve Months (TDiTM) series of stitches. And, I have always had to direct readers to the free wiki site that has the files loaded...since it is not possible to upload pdf files directly to the blog. However, through a handy tip about blogging...I have found you can upload any pdf file (that you don't mind being in the public domain) directly to Adobe and they will store it free of charge. And they provide you with a handy link code for you to re-insert into your blog so folks can find the file. So, I thought I'd share a favorite template sheet of mine; and hope you enjoy working with these. The file takes a minute to load, so have patience. Then just print...copy to a transparent sheet (any copy place can do this...we used to call these "over-head projection sheets"). 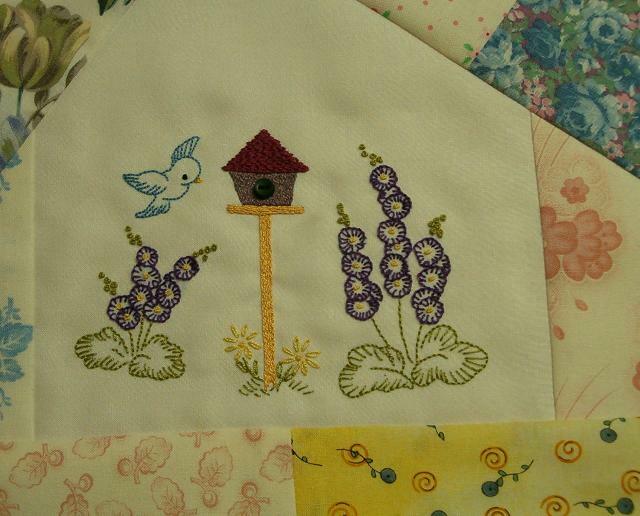 Cut the template into different strips so each stitch is it's own separate template. Punch out the little black "dots" so you have holes for your needle...and viola! Your own templates...and they are free! Or just copy the image above, and paste in into any word or publishing or paint document. Re-size as you wish! Just, don't resale it as that would be against my copy write. Of course, if you would prefer not to do all of this work...I will do it for you at a minimal cost...just send me a note. 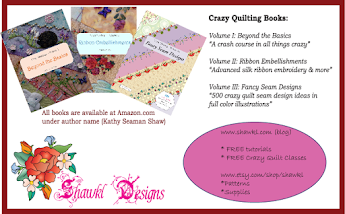 Or if you are on Facebook...just send a message to Shawkl Design Studio and we'll work out the details. And, the CQ Wiki site has more of my free templates...just go back to the first posting about TDiTM to find out how to get to the site. If you enjoy using templates for your stitching...you might want to do a web search because there are companies that do sell various templates. 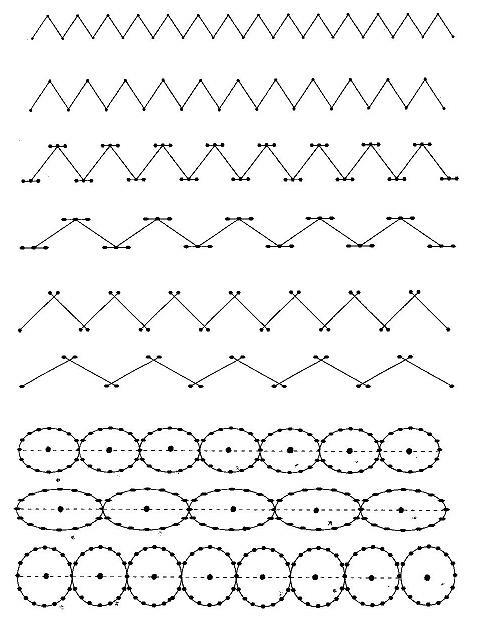 Primarily they are plastic sheets that have holes punched in them in various grid patterns. Most come with a booklet that shows you which holes to use for what type of stitches. These are good...and I own about five different types! However, I frankly don't use any of them...I don't have the time to "figure out" which hole every time I want to do a stitch...so, I created my own. 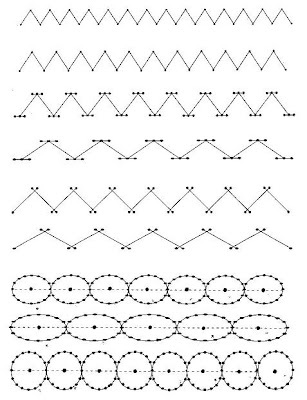 I like seeing the triangle, or herringbone, or circle...etc. It makes it faster for me to pick up a template and "draw" some dots on my seams so I can stitch faster with great results. And, I don't mind sharing...which is why you get them free...if you don't mind doing a little of the work. 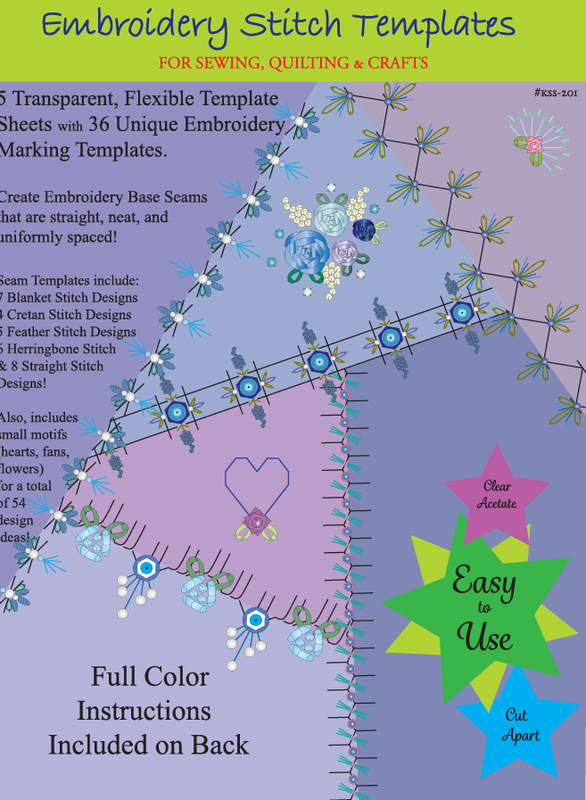 Here's a new shadow applique pattern for you. It is fast and easy! So, if you have new babies entering your life...consider making this scrappy little quilt. The center design and four corners are shadow-work applique...just fuse the pieces down, cover with chiffon or organza, and stitch a simple running stitch (quilt stitch) around each piece. The pattern pieces and the pattern layout are both pdf files and I have uploaded them into my adobe acrobat account. Just click and they are available to you...free! If you like working with shadow applique, don't miss the angels, florals, and fairies in the Studio...link to my shop is at the top of the page. I have been busy this week, but most of it I can't share just yet. On MAP we are having a christmas ornament swap...and my three are also almost done. 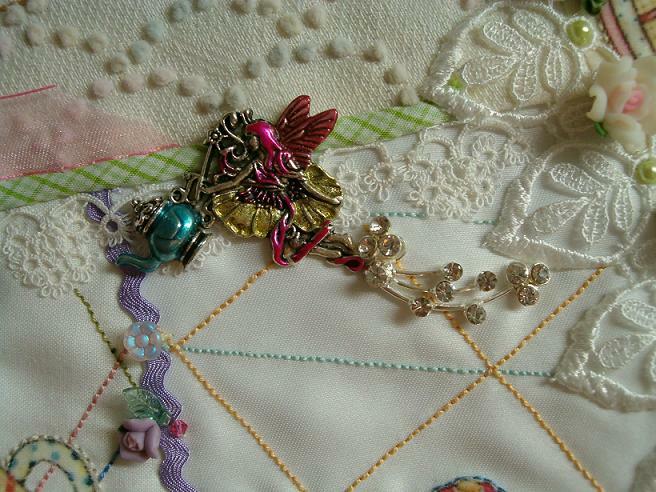 And, since they are a surprise for the swap partners...I can't show you them either! 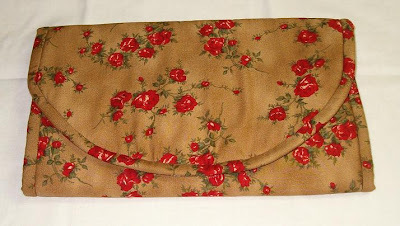 Next, I have been working on a design of a purse for a friend...and we are both so busy, we have "pushed" our self-made deadline back three times...we are up to next year right now! 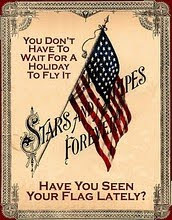 But I'm hoping to get it done sooner...even so, I can't post!! Yikes! What to share? What to share?